After the surgery, you will be shifted to the recovery room where you will be able to meet your relatives. You will be observed by the doctors in the recovery room for about 6 hours. Oral fluids will be given to you 4 hours after the surgery; soft diet will be provided late in the evening. You will be discharged after 7 pm the same day. If a simple Arthroscopic Procedure like excision of Menisci or Loose Body Removal is done for you then you will be advised full weight-bearing without any support from day 1. But if a procedure like an Arthroscopic ACL Reconstruction is done for you, then you will be out on a brace and will require a walking aid for about 14 days. You will be explained the post-operative rehabilitation program by Dr. Amyn Rajani and his team of physiotherapists. Patients usually recover from Knee Arthroscopy much faster than they recovery from traditional Open Knee Surgery. You will be visited by a competent physiotherapist at home and the strengthening exercises will begin gradually. You will have to visit Dr. Amyn Rajani again after 48 hours for change of dressing. Clips will be removed on day 12 of surgery in the comfort of your home. Your next visit to Dr. Amyn Rajani will be on day 15. Swelling can be minimized by keeping your leg elevated as much as possible for the first few days after surgery. 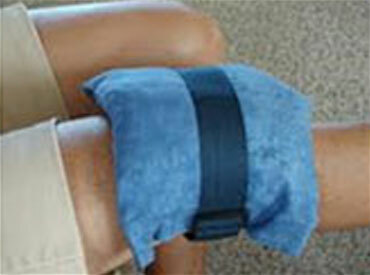 Pain and swelling are minimized by application of ice. After simple procedures like removal of Loose Bodies, Meniscectomy etc. the patient can walk unassisted. In Reconstructive surgeries like ACL/PCL Reconstruction, the patient may bear full weight but will require a walking aid. In procedures done for cartilage damage, Menisci Repair etc, the patient has to be non-weight-bearing for about 6 weeks after surgery. Exercise is generally taught to you before the surgery by Dr. Amyn Rajani, so that you can immediately start these exercises after the surgery. Strengthening the Knee Muscles is a very important aspect of Knee Rehabilitation. You will be given an antibiotic to prevent infection and an anti-inflammatory medication to decrease the inflammation after the surgery. After simple procedures like Loose Body Removal or, the patient can resume driving after day one, but after reconstructive procedures the patients has to refrain from driving till at least 6 weeks.